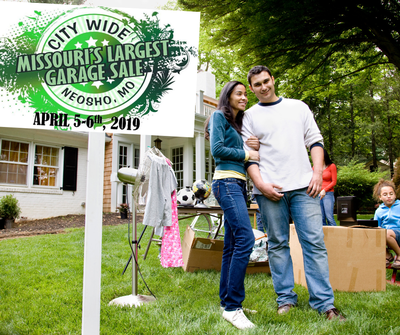 Missouri's Largest Garage Sale... 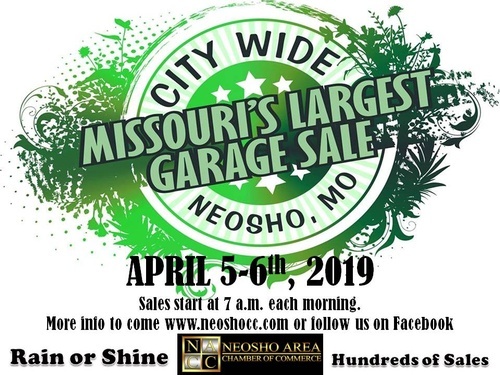 The Neosho City-Wide Garage Sale is April 5th &amp; 6th, 2019. Over 400 Sales in and around Neosho, MO. Rain or Shine, Sales Start at 7am Each Day. Call the Neosho Area Chamber of Commerce for More Details about any of the following 417-451-1925. 1. Do You Need to Reserve your Rooms Now to get an Early Start? 2. Do you need a place to set up to have a sale?